This Autumn Chopped Chicken Salad is loaded with crisp pears, tangy craisins, pecans, feta and juicy chicken! The simple balsamic vinaigrette will win you over. Cut chicken breasts in half lengthwise so you have 4 thin cutlets. Season chicken cutlets on both sides with garlic salt and black pepper. Place a large skillet over medium heat with 1 Tbsp olive oil. Add chicken cutlets and sautee 3-4 minutes per side or until fully cooked through. Transfer to a cutting board and let chicken rest while preparing the salad then slice the chicken into strips. Meanwhile, in a medium dry skillet, toast pecans over medium heat for 5 minutes, tossing frequently or until pecans are fragrant and lightly golden. Remove from heat and cool to room temperature. 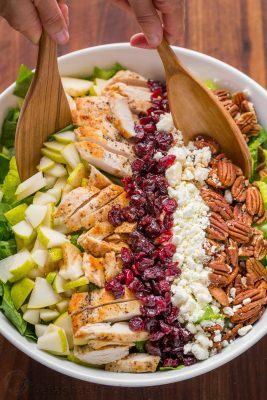 In a large mixing bowl, combine chopped romaine, sliced pears, dried cranberries, toasted pecans, crumbled feta and cooked sliced chicken. Combine dressing ingredients in a small mason jar. Cover with lid and shake vigorously to combine. If any separation occurs, shake again just before using. Drizzle balsamic vinaigrette over the salad, adding it to taste then toss to combine.